Understanding the genetic differences that predispose addictive behavior in one individual versus another could significantly influence treatment options and outcomes for patients. Moreover, identifying the genetic factors that cause some to stay clean, while others relapse, is of significant value to clinicians and treatment facilities. Now, researchers at the University of Michigan (U-M) Medical School, have uncovered new information about the roles played by both inherited traits and addiction-related changes in the brains of laboratory rats. The scientists used selectively bred animals to show that the propensity for addiction is linked to differences in expression of genes for specific molecules in a particular brain region. Furthermore, this is the first study that identifies an epigenetic marker that can predispose an individual to addiction and relapse. The U-M researchers looked in the rats' brains for the genetic instructions needed to make an essential “pleasure receptor,” called D2, which allows brain cells to receive signals sent by the brain chemical dopamine—or cocaine. They found that more addiction-prone rats had lower levels of D2 instructions to begin with, compared with other rats, in an area of the brain known to play an important role in addiction. Additionally, the addiction-prone rats also were more likely to carry a specific epigenetic tag—H3K9me3—that repressed the neuronal D2 promoter region. However, after they became hooked on cocaine, the addiction-prone rats had the same levels of D2 as the less addiction-prone ones. And when the cocaine was taken away for a while, the rats were more likely to relapse to addictive behavior if they had started out with the H3K9me3 tag that kept their cells from reading the D2 gene. By contrast, a comparison group of rats did not show signs of addiction and did not relapse following abstinence. Surprisingly, the investigators found that the “addiction-resilient” rats started out with lower levels of instructions for making a different brain molecule also known to play a role in addiction, called fibroblast growth factor 2 (FGF2). They were also more likely to carry an epigenetic mark that kept them from reading the FGF2 gene—possibly protecting them from becoming addicted. 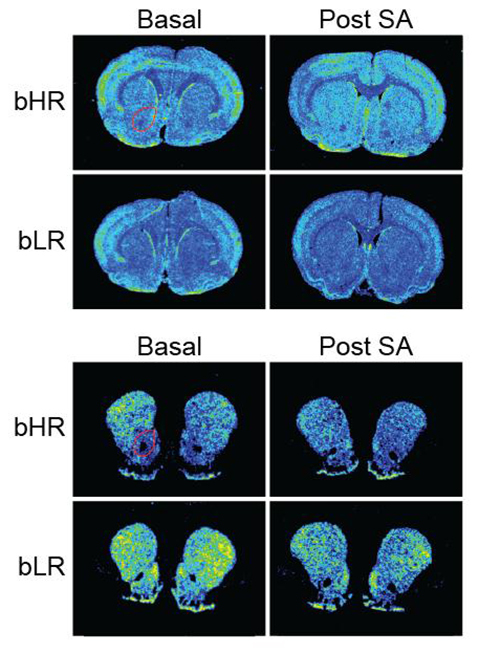 The two breeds of rats used in the study—bHR for high responders (addictive phenotype) and bLR for low responders (addictive-resilient phenotype)—allowed the scientists to study the impact of drug use and addiction on gene expression and epigenetics in the nucleus accumbens, the brain's “pleasure center,” where response to drugs like cocaine occurs. Typically, the dopamine system in this area responds to naturally pleasant experiences and prompts us to pursue them again. The researchers are now using broad-based genotyping to uncover other genes that contribute to various facets of drug abuse and addiction. These genetic findings could point to potential biomarkers and more targeted treatment strategies for substance use disorders.